Twenty-five years ago, the first modern hot air balloon in Russia went up in the air. Since then, over 650 people have received balloon pilot licenses and there are now some 600 hot air balloons around. With 30 to 50 new balloons being made in Russia every year, ballooning enthusiasts are optimistic about the prospects for developing the pursuit in Russia. Alexander Yevdokimov may have a mundane job from Monday to Friday, but his weekends are anything but down to earth. In fact, Yevdokimov spends most of his free time up in the air. The energy engineer is devoted to an activity that is growing in popularity across Russia - hot air ballooning. For three years now, he has been an independent pilot and even takes part in competitions. "The first time I paid any serious attention to hot air ballooning was when I was in my first year at university and went on a trip to the Moscow Region,” says Yevdokimov, who first became interested in hot air ballooning five years ago. “Back then, I had no idea how to pilot a balloon or where, how and how long one has to learn to do it, but I couldn’t get the sight of it out of my mind," the young man recalls. Later, a friend of Yevdokimov's started a business offering balloon rides in a Moscow park and Yevdokimov began to assist him. "Later, I got a pilot license myself. Now it is a hobby of mine that I spend all my free time on," he says. One of the founders of hot air ballooning in modern Russia, who declined to give his name, recalls that as the Soviet empire was entering its decline, people developed an adventurous urge to become pilots and to make money from the pursuit too. "Besides, this hobby allowed you to visit other countries, which was very attractive given that previously foreign travel had been practically banned,” he recalls. “So a group of enthusiasts got together and began to build a balloon of their own. Later a company making light aircraft was set up and hot air balloons became one of its branches." "These consist of the fact that the kit is taken to the launch site by road because it weighs 300 kg (47 stone), then the balloon goes up in the air and the vehicle needs to get to the spot where the balloon is expected to land as quickly as possible. But that is not always possible, and carrying 300 kg back to the vehicle is not easy," he says. Ivan Menyalo, a balloon flight instructor and a member of the Russian hot air ballooning federation, says that the laws in recent years have been seriously liberalized and flying has become easier, although still there are not that many balloon pilots in Russia. 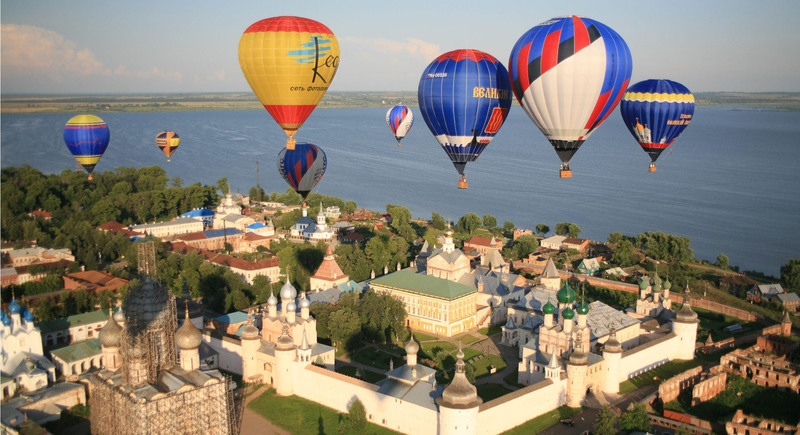 "This year marks the 25th anniversary since hot air ballooning came to Russia. The first balloon went up in the air in 1989 at the Tushino airfield. Since then, some 650 people have received pilot licenses and there are some 600 balloons in the country, both imported and domestically manufactured,” says Menyalo. “Hot air ballooning is something that a person can live without, it’s a hobby for those who have the money and time for it. That is why ours is a small community: Counting [competition] judges and passengers, [there are] just several thousand people," he says. According to Menyalo, hot air ballooning began to boom in Russia in the mid-2000s, when people who had enough funds to purchase balloons for their private use first appeared. Those who were passionate about flying would get together and buy a balloon to share and to travel in it. "This is one of the most affordable and safest means of air travel. It’s also very pleasing aesthetically. There are people of different ages among the pilots, there are even whole dynasties now,” says Menyalo, who adds that while part of the community is made up of former professional pilots who have just switched to a quieter way of air travel, others are those who have dreamed about flying since childhood and those who were hooked the very first time they saw a balloon. “Whenever I see a balloon up in the air, I want to stop, take a picture and wave to the pilot. There is no turbulence, no rocking and shaking, everything is smooth and beautiful; and there is no need for any airports or complex maintenance," he continues. It takes two to three weeks to learn how to pilot a hot air balloon. The training costs from 100,000 to 150,000 rubles ($3,000-5,000), while a Russian-made balloon costs about a million rubles ($30,000). About 50 more people get pilot licenses every year. Menyalo is convinced that hot air ballooning in Russia has great prospects: "It can develop both as a sport and an event business,” he says. “There are many places in Russia where you can fly, far more than abroad."